Recently, the foci are several. One result is that "All things Gardner" is a theme of importance. That view continues what Dr. Frank started with his Gardner list (one of the most-read posts). So, we will be updating his table of Gardner families. Too, we will get the descendants for Thomas of Salem filled in (see Wikipedia, for example - we will move this list to its own page). There as still progeny issues to research. In short, no end in sight. Except, the 200th is coming up. That is, the western expansion that made America was it is. In my mind, that out weighs the 400th. But, they go together. Would not have one without the other. Remember, the 200th events followed Jefferson's land deal, the culmination of the 1812 skirmish, and a whole lot more. U.S. students cover this stuff in their studies. Now, motivations come various ways. Queries help. But, following families is a necessary item. However, in doing that, along with filling in family sheets, and such, we need to keep our eyes open to places and events. And, where Gardners pop up. So, one family in a western situation (pioneering) offshoot had partnered with a Gardner. Does that not raise interest? Well, as I started to look further, I saw other Gardners. And, I picked one to follow since it dealt with the meat of the west. Well, diary mostly (Holstein-Friesian herds). Basically, I found reports of an association where W. H. Gardner is mentioned. Seemed to be a character. He was deaf. His wife interpreted for him. Now, that is not the usual mix one expects for a successful couple. Well, finally, I found a little bio. However, I also did searches on the U.S.Census and other sources. Finally, I found his findagrave page. His name is Malcolm Hazard Gardner. His photo looked familiar. In short, there are things pending, but here is the findagrave. It'll be updated. It has the photo and the bio (MHGardner). Soon, there will be links to parents, siblings, and such. 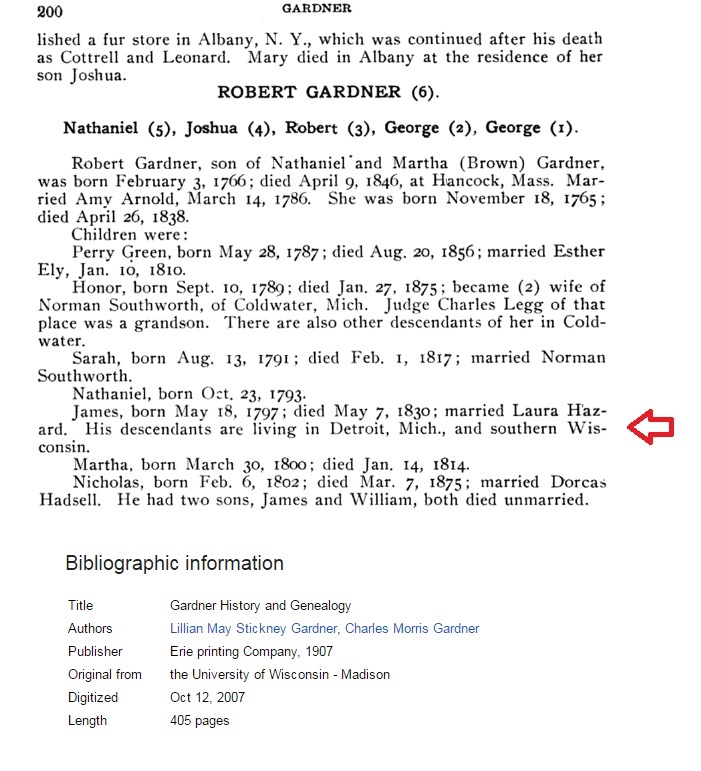 So, having found his father, I could identify the Gardner family. It was George of Rhode Island. This is the page for MH's grandfather in one of the books of the family. This is typical. Dr. Frank did not go much outside of New England. Lots of books have a New England focus. I even saw one family drop a son because he moved 100 miles away. So, that is minimal in the sense of our western, big sky reality, folks. In one family book, it says that the guy is out in a western state. Well, I have filled in the missing information (to be published). Why put the Gardner book of George? Motivation. If you look at this book, you'll see that the early chapter tells of a reunion in mid-west state in the early 1900s. That was the 300th time (and 100th time, as in not long after the wagon trains). 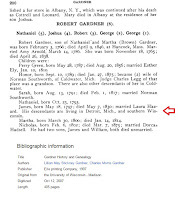 In both the Massachusetts Magazine (see links to the digital copies), Lucie, sister of Dr. Frank, had regular reports on genealogy. We need to pull those out to view. Last year, I went through these and referenced some articles. In fact, I found one still being cited. Where, how, when are questions to resolve in how to handle this work and the presentation of results of work, etc. 12/18/2016 -- Articles about research published in The Gardner Annals, Vol. III, No. 1. 10/11/2018 -- Gardner Research is how we are organized. On the plate is a lot starting with extending the work (e.g. Gardners and Gardners) of Dr. Frank. I've always wondered if the people of the western America are now more genetically predisposed with a sense of adventure or wonder-lust compared to their east coast relatives~? Going west on the most part was a conscience decision, that took much planning and much money. You had to want to be there. The family bonds east and west appear to be way stronger in times past. Entire congregations as a group picking and moving west in search of better prospects.. It was common place for land speculators to show up at Sunday church service in the east and sell the wonder of free land in the Ohio Territory or Kansas or Beautiful North Dakota with EZ terms.. London and New London, York and New York or Cumberland Co Ny, Cumberland Co. Nj, Cumberland Co, Va and Cumberland Co Pa, and NC and Tn..
Their was a time that the naming of some communities represented a bond with their eastern family.. Along with that is the joy of driving long distances notwithstanding Google's and others'attempt at removing that from us. 200K miles over the past few years.